Crispus Attucks Park is a privately owned, publicly accessible open space located in the diverse Bloomingdale district of NW Washington, DC. The nonprofit association of neighbors received a grant from the TKF Foundation for the design and construction of a Sacred Space within the park. We led a public master planning process for the park, and then developed schematic design alternatives through community design charrettes. 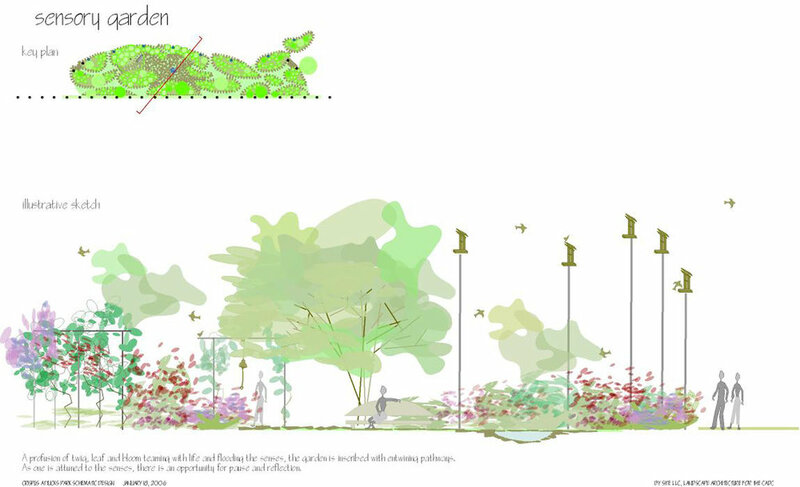 After the selection by neighbors of a preferred scheme, we developed the plan as a Memory Garden in honor of the park’s namesake, Crispus Attucks, and in honor of neighbors who had made their own impact on the life of the park—a place to remember. The full-service landscape design agreement included the production of construction documents, contractor bidding, and construction observation. The Crispus Attucks Memory Garden is composed of gently embracing landforms with a tapestry of flowering trees, shrubs, and groundcovers along a curving path that arrives on an intimate clearing in the woodland—a place of sanctuary, repose, and reflection for the park’s neighbors and members of the Bloomingdale community.